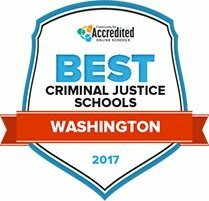 Start making changes in your career and your community with a degree from a criminal justice school in Washington. Employers in every corner of Washington, from Spokane to Walla Walla to the Olympic Peninsula, are looking for qualified individuals with strong backgrounds in criminal justice. A degree from a criminal justice school in Washington can help new applicants stand out and can improve a current employee’s qualifications and performance. Continue reading to learn what schools best fit your needs and to explore the different career fields available. After Criminal Justice School in Washington: What's Next? The criminal justice field encompasses a wide variety of professions that call for different academic requirements. To help students narrow down this search and find the best school or program for them, we have ranked schools across the country based on a variety of current criteria important to students, such as up-to-date tuition costs, total enrollment, student-to-teacher ratio, and acceptance rates. Explore the top-ranking criminal justice schools and programs for 2017 here. Pierce College at Fort Steilacoom offers associate degrees, and technical and professional certificates in criminal justice. Students who wish to pursue a career in the law enforcement and forensic science fields may choose to enroll in Pierce College's criminal justice program. Students interested in an associate degree in criminal justice will complete a minimum of 104 credit-hours, and 44 credit-hours for professional and technical certificates. Pierce College utilizes Canvas as its overall class management system. Student services including career and disability resources are offered at Pierce College. FAFSA financial aid and scholarships are available to qualifying students. Spokane Community College (SCC) offers a two-year program in criminal justice and a technical track in corrections. Associate of applied science degrees and technical certificates are available for students to receive upon completion of the programs. Physical fitness courses, law enforcement courses and general education requirements are part of the curriculum at SCC. Certain credits earned at SCC may be transferable to four-year institutions. Students at SCC may manage classes and communicate with professors through the Canvas software. The competitive law enforcement club Rho Beta Psi has a chapter at SCC, and the chapter has earned 13 championships in the last 15 years. The criminal justice program at Wenatchee Valley College (WVC) offers a corrections certificate, and a criminal justice associate of technical science degree. The corrections certificate requires a minimum of 45 credit-hours, and the criminal justice associate of technical science degree requires 90 credit-hours. WVC's criminal justice program combines realistic training exercises with courses including juvenile justice and crisis intervention. WVC uses Canvas as the class management system, students may submit assignments and communicate with professors through Canvas. A student residence hall is available for students interested in living on campus. Qualified students may receive FAFSA financial aid and WVC scholarships. Whatcom Community College's criminal justice program offers a 90-credit associate in science degree program and a 45-credit certificate program. Students interested in pursuing a career in criminal justice may choose to enroll in Whatcom's criminal justice program at the start of any school quarter. Whatcom uses Canvas as its learning management system. Students may submit assignments, and communicate with professors and classmates through Canvas. Counseling services, tutoring services and disability resources are among the variety of student services available at Whatcom. Students may apply for financial aid through FAFSA, and qualified students may earn scholarships. Edmonds Community College (EDCC) offers a path to Washington State University's bachelor of art degree program in criminal justice. The EDCC criminal justice program offers associate of applied science and associate of arts degrees as well. Almost all of the programs at EDCC may be completed or partially online. The criminal justice programs include coursework in political science, sociology and psychology. EDCC offers housing to students interested in living on campus. Grants, scholarships and FAFSA financial aid are available to qualified students. Student services including counseling and disability resources are accessible to EDCC students. With a main campus located in Ellensburg, Central Washington University consists of seven campuses located around the state. Three CWU campuses, Des Moines, Lynnwood and Ellensburg, offer a bachelor of arts degree in law and justice. For undergraduates interested in pursuing off-campus learning, the BA in law and justice program can be completely entirely online at CWU from any location. Within the constructs of the program, students are able to design course schedules modified to fit their interests. Popular career focuses include court administration, paralegal, correctional officer, juvenile justice and law enforcement. A graduate study program is available at CWU's main campus. Home to the oldest criminal justice program in the country, today Washington State University bases the program in studying sciences such as psychology, sociology and political science. Students can earn a bachelor of arts in criminal justice and criminology and are encouraged to take advantage of various study abroad opportunities. Undergraduate internships in diverse law enforcement organizations, such as the campus or even state police, are promoted as another method of out-of-classroom education. WSU is also the site where the national criminal justice honor society was founded, now boasting more than 360 chapters across the states. Seattle University's criminal justice department has six different emphasis areas within its bachelor program. Science enthusiasts can enroll in the bachelor of science program with a specialization in forensic psychology or forensic science in preparation for a career in a crime lab or as an investigator. The bachelor of arts degree option includes the previous specializations plus the justice theory and administration of justice specializations which do not require as much raw science education. To enhance the learning experience in a real-life setting, SU provides contacts and advising for internships among numerous agencies in the Seattle area. As part of graduation requirements, criminal justice students at Saint Martin's University independently research and highlight a relevant ongoing issue presented in a senior capstone project, a two-semester culmination of work. The bachelor of arts in criminal justice degree features both traditional and niche studies to expand the student's knowledge arsenal. Although not mandatory, faculty members urge students to participate in research and internship opportunities in agencies such as the Washington State Department of Corrections and the Lacey Police Department. This program readies students for graduate school or employment in areas such as administration, counseling, forensics or law. Taking a career-focused approach to studying criminal justice, undergraduate students at Heritage University learn critical skills of the field including communication, theory, and hands-on application of course learning material. By familiarizing students with these area-specific skills, students are expected to be well-equipped for various occupations in their respective area of criminal justice upon graduation. Graduates may be eligible to enter positions in the private and public sector. For further academic development and networking, criminal justice students are encouraged to join the Heritage Justice Circle (HJC) where they are able to explore careers, dive deeper into their academics, and meet working professionals in criminal justice. A degree in criminal justice can help you join a variety of careers in Washington, from vital law-enforcement jobs to fields related to the function of the state’s court system. Start exploring your options by looking at the most popular jobs in Washington’s criminal justice fields; the table below shows some of these careers with along with the number of individuals working in Washington, the median salary, and the degree level typically required. Criminal justice graduates in Washington are greeted with an exceptionally strong job market in a large range of careers. Indeed, Forbes named Washington the second-best state to make a living in for 2015. That comes as no surprise when you consider that many Washington careers have annual salaries and growth rates above the national average. Criminal justice graduates have a wide range of options in Washington state for potential careers, from patrol officers on quiet streets of Davenport to paralegals in downtown Seattle. Some of these careers are on the protective services side, while others are more closely involved with the court system. Overall, there are a variety of ways to put a criminal justice degree to work in Washington. The WFOA is an association of government finance workers. The organization offers a variety of networking opportunities as well as an extensive directory to relevant departments in Washington’s government. Washington’s ACC is an excellent way to network with those involved in corporate and financial law. Additionally, the organization releases a newsletter that includes news, events, and other happenings relevant to the profession. The SBDC of Washington works with small business owners, providing resources and access to business advisors. It also hosts networking and workshop events. This website, run by Washington state’s government, gives extensive guidance on starting and running a business. Additionally, and most relevant to someone involved in business compliance, the website also includes extensive resources on state and national business regulations and law. The membership-based WCCE provides resources and networking for Washington businesses as well as information about tourism. The SBA offers resources for finding small business financing as well as information about starting and managing a business. This is the official website for Washington’s department of corrections; through this website you can find information on different DOC events, programs, and even a helpful list of definitions of DOC terms and acronyms. The Washington Correctional Association is an organization for professionals in the field of corrections. The association hosts events, fundraisers, and publishes a newsletter. This company employs incarcerated offenders; in addition to information on its business, the company’s website also provides information on in-facility offender work programs and educational opportunities. The Office of Juvenile Justice provides information and resources for juveniles and families who are dealing with the justice system. This organization seeks to provide inmates and released offenders with programs and tools that promote nonviolent communication and mindfulness. It serves prisoners in five Washington state prisons as well as former prisoners in the Puget Sound region. The Washington Court Reporters Association provides scholarships, organizes conferences, and has extensive resources relevant to a court reporter, such as the different certifications and information on continuing training. This page is an extensive directory, linking to other websites that provide public records, municipal codes, and dozens of other resources vital to anyone working as a lawyer or elsewhere in the judicial system. This page of the Municipal Research and Service Center is a directory of municipal codes and general ordinances of nearly every city in the state of Washington. This is the official website of the Washington court system. Here you can find a directory of the different courts in Washington, a case records search, and self-help legal resources. Offered by the Washington court system, this website allows visitors to search the Washington state law library’s catalog and chat with a librarian. The Washington State chapter of the national Court Appointed Special Advocates group provides volunteer advocacy services for placing children in safe, permanent homes after they’ve been abused or neglected. This is the website for Washington’s primary organization of paralegals. The association has multiple regional chapters throughout the state and information about the different paralegal certificates available. This organization is dedicated to providing resources and, if possible, legal representation to low-income families and individuals in various Washington counties. The plain-English resources can be vital to someone interested in law, especially the laws and regulations related to evictions. This public law library provides extensive guides for different types of law-such as landlord/tenant agreements-in addition to access to the library catalog and classes. The WSBA provides information about lawyer licensing and additional resources and networking opportunities for the legal community. This directory provides links to the webpages for bar associations that serve lawyers that fall under racial, ethnic, LGBT and gender minority groups. The Attorney General’s office handles consumer protection in the state of Washington as well as legal representation for state entities and employees. This commission provides information on joining a wide variety of safety enforcement careers such as resources on certifications, training, and relevant news. WALI is an association of private investigators in Washington state. The organization largely focuses on maintaining a strong and positive reputation and additionally provides resources and a directory of members. This association and its website provides resources for law enforcement professionals in Washington, as well as forums for discussion and other networking opportunities. The Washington Council of Police and Sheriffs works to promote the interests of law enforcement workers and to support them through legislative and personal means. The council assists with topics such as insurance and hosts events. This membership-based organization provides information, resources and advocacy for state troopers in Washington. This group works to organize and support those who combat computer related crimes, whether those individuals work in private or public sectors. The organization also hosts events. Washington’s DNR provides a variety of resources for those interested in the environment, including a directory of programs, maps, and permits. This web page is a directory of environmental laws and regulations for the state of Washington. Additionally, the page lists the homepages of different environmental agencies. This organization works with charities and businesses in Washington to resolve environmental issues and improve relations between the two groups. This organization provides volunteer opportunities as well as the chance to network with a wide variety of groups. The WEC works to solve environmental concerns in the state of Washington through education and legal advocacy. This page provides employment opportunities for people who want to work in Washington’s state parks, including law enforcement roles. This page provides information about the roles and responsibilities for fire investigators for Washington state’s wildlands.